"A good shot is worth more than a good intention." Profile: Warpath thinks he's a lot more impressive than his comrades do. Certainly, no one would argue with his sharpshooting ability. It just seems at times he's more concerned with showing off than the welfare of the Autobots as a whole. But his boisterous, loud-mouthed personality makes him welcome company and his raucous sense of humor can bring cheer to the gloomiest situations. Only one thing seems to upset him: any small nick or scratch to his gun barrel. He's both very proud and very vain about his weapon. His comrades fear that if his gun ever suffered anything as big as a dent, Warpath might be too depressed to talk for a month! Abilities: In his tank mode, Warpath can travel over the roughest terrains at speeds of up to 30 mph. He can hit a hex-nut at a distance of 1.5 miles with a shell from his gun. He has a variety of shells available to him: explosive, thermal, cryogenic, acid, and sonic, among others. His thick vanadium-steel armor can withstand all but the toughest blows. He has great strength in tank and robot modes. 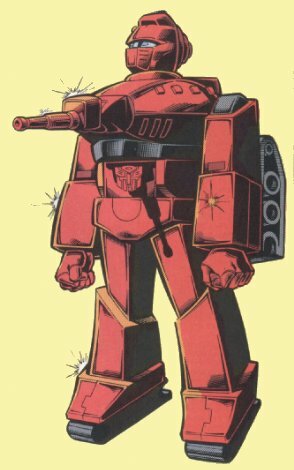 Weaknesses: Warpath is virtually helpless if upended in tank mode, His movements can be severely hindered if his treads are damaged. He's slow, but his firepower and toughness help compensate for this deficiency.